The proposed project, The Underline – Segment 6 (“Segment 6,”) is 1.98 miles of a whole planned 10-mile mobility corridor known as “The Underline.” The Underline repurposes underutilized industrial space beneath the most widely used regional transit heavy rail system to improve multimodal safety and access to Metrorail and the greater regional mass transit system. The project includes the design and construction of dedicated pedestrian and bicycle trails; the modification and improvement of six intersections; the addition of a bicycle/pedestrian bridge over the Coral Gables Waterway; the reconfiguration of the University Station parking lot to allow for the expansion of services to transit users, walkers, bikers, students, and staff; new lighting; signage and wayfinding. 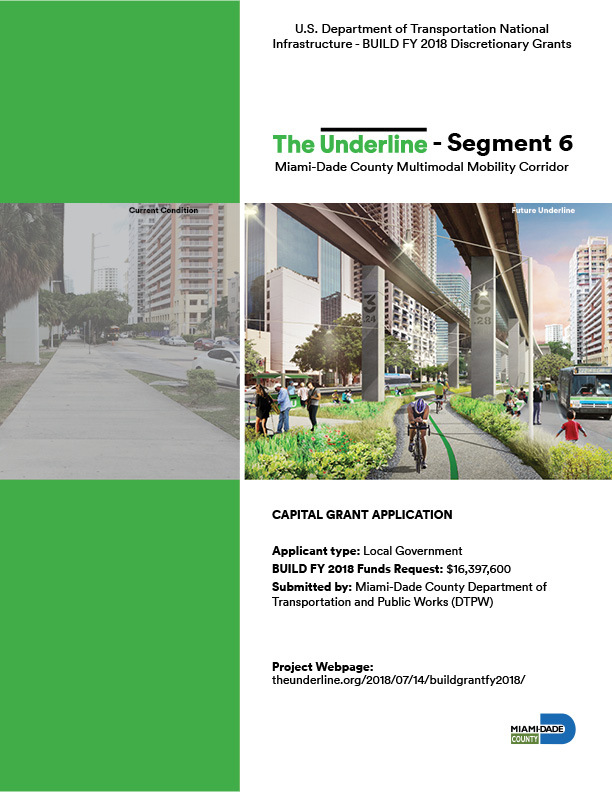 The Underline – Segment 6 is of particular significance because of its connection to the University Metrorail station, one of the most frequented stations along the corridor, given its direct relationship to the University of Miami and the City of Coral Gables. The diverse range of users, including students, faculty, University employees, visitors and neighbors, inspires a program that balances transportation, education, culture and innovation with opportunities for retail and recreation. The project will enhance first and last mile connectivity to the University Metrorail Station and improve safety by redesigning six intersections, adding a new pedestrian/bike bridge over the Coral Gables Waterway and providing new lighting. In addition, the project will increase Metrorail ridership and reduce congestion along the U.S.1 corridor. It will become an alternative mode of transportation with inviting spaces that foster community, increase property values, remediate contaminated conditions, accommodate recreation, facilitate connectivity, improve social exchange and activate residents to a healthier lifestyle.